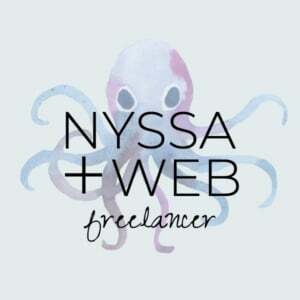 I'm Nyssa, and I'd love to work with you to create your very own slice of the web. Whether you've got already got a site that's long over due a make over, or you're just starting out, I'm here to help you every step of the way. I would love to keep you up to date about future offers and will be emailing fortnightly with helpful topics about WordPress and Shopify. As a thank you to anyone who signs up, receive 10% off your next quote. I am a degree-qualified freelance web designer and developer living in Sydney and I’m here to help you with your next website project. I am passionate about what I do, and love putting together stunning websites. I’ve been in the industry for over 10 years, and have developed numerous websites, working directly with boutique businesses and graphic designers to help turn their ideas into a reality. I'm passionate about creating amazing websites using clean and well written code. In this ever-evolving industry, I believe it is essential to stay on top of new techniques and trends whilst maintaining a balance of usability and functionality. And, of course, still creating beautiful websites. Whether you just want to make a few tweaks to a theme, or a full site design, I'm here to help your digital dreams becoming a reality on a site you will love. I will work with you, taking inspiration from your logo, branding, and sites that reflect the image you want to portray to your customers. Setting up a new website can be scary, but I’m happy to help you every step of the way, from registering your Domain Name, to choosing and setting up your hosting and all the fiddly bits in between. I'm here to answer your little questions, and provide you with video tutorials on how to do update all aspects of your site. As a small business owner, I know just how important it is to keep track of spending. The last thing you want is any hidden surprises when it comes to building your online website. So, while many web developers do not display their prices, I’m more than happy to do so. I like to be as transparent as possible about my pricing, so you can keep to your budget. And I know every business is unique, so if any of the below packages don’t fit? I do encourage you to reach out and request a quote. If you know your way around WordPress, or just want to make use of the numerous tutorials and resources out there and give it a go yourself, this package might be the one for you. Cost of hosting, domain names, and SSL certificate in addition to the quoted price. The perfect package if you’re on a limited budget, and want to still have an amazing website that still includes some of the fabulous features that a quality template can offer. If you need a site that is uniquely your own, then this is the package for you. It includes wire-frames, mock ups, and plenty of time to revise and provide feedback to create a website that you can be proud to showoff. * Time length can vary depending on when content is provided and how long approvals take. I know every business is unique, so if any of the above packages don’t fit? I do encourage you to reach out and request a quote. Lead time to begin work on booked projects is typically 2 – 3 weeks. Enter the details of your project below and I’ll get back to you as soon as possible. Want to provide a little more detail? Fill in my custom quote request form.